Last month I told the story of how StencilGirl started, the original six stencils that I designed and how we got our name. If you missed that tale, you can always click this previous Blog Post to catch up. Today, I am giving you a little peek behind the scenes. We are a very small, family run company, manufacturing stencils here in the USA. I realize our website makes us look like a big company and many folks imagine we have hundreds of employees working for us. I started the company with my husband John in 2010. We brought our son-in-law, Frank on board a couple years later. We have a few other people who work with us, but the group is small, we haven't reached 2 digits in number. We work out of our house and own lasers. They are really simple to operate, but they are pricey little devils. When we have huge demand stencils we sub them out to an undisclosed location also in the USA, people I adore and trust to maintain the quality we demand. We are that kind of company. We are close knit and do things the old fashioned way. We don't package all the stencils, the ones we sell directly to our customers are mailed unpackaged due to our efforts to be 'green.' We do package the stencils that are purchased by Retail operations worldwide. As you know, we have Artists who design every single stencil. What you might not know is that we pay our artists a royalty for each and every stencil that is sold. I am so proud of this it makes me squeal with delight. I shot some footage of our operation and made a video for you to get the idea. 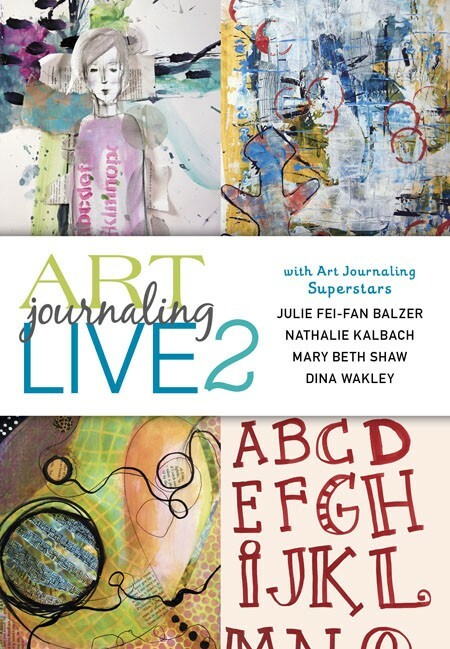 And now......announcing the release of Art Journaling Live 2. I was rocked beyond words to be selected to participate in this Live event which was recorded in June of this year. I feel like such a journal newbie compared to the other superstars. Wow oh wow, to hang out with Julie, Dina & Nathalie was beyond my wildest dreams. And now it has been preserved as a DVD value at $49.99. I am thrilled to give away a copy of this DVD to one lucky winner! Leave me a comment below as to why this DVD would change your life - don't hold back! Your entry will be judged for creativity and authenticity. I need your email (of course), you know the drill, email at dot com. Don't forget that part. We will make our decision on December 12th at midnight CST and announce our winner. And......should you find yourself wanting to purchase the DVD, you may find it here. Thanks for reading & entering. Next year will be a time of transition for my family as we are moving to a new state. Art journaling certainly keeps me a little less stressed. It would be great to learn a bit more from some of my favorites! , MaryBeth, John and Frank and your team, for all the hard work you do! I'm sure the other designers feel as grateful and happy as I do ... so glad to be with SGP. What a wonderful program, Mary!! Wonderful, MaryBeth!! I'm very happy to hear your company is a cottage industry in the USA; I am very much in support of both those initiatives! As for how the DVD will change my life... My mother passed away year ago in September. She and I were extremely close and I, rather intensely over the past 4 to 5 years of her life, helped her to live in her own home. It was my honor and pleasure to care for her as I did and, if I had my wish, would be doing so still. As we all know, family dynamics can be extremely difficult. After my mom passed, some of my 5 siblings had shown their true colors - both positively and negatively. I've never called myself an "Artist", only a crafter, rubber stamper, quilter, etc. The art journals I have begun are to house the styles of work particular to an instructor or class I have taken. I do not have a general or daily art journal I use to get the feelings out that need to be expressed, or to try different techniques. I think there is still some fear/anxiety there. I am hoping working with this DVD will teach me to bury that fear in a very deep hole in the back yard while I work through some of the lingering feelings I have with my family and my mom's passing. I need to allow myself to become an "Artist" versus a crafter. That is what I hope to accomplish. It is a very tall order! Such a thoughtful post, Jezebel, I appreciate you taking the time to share. I have had illness in my family over the past few years and this is when I really started to Art Journal in earnest. It has helped me immensely. Kudos to you and your 'staff'! You have great product and wonderful service! TJ, thank you SO much for the kind comment. It is very important for me (as a person & a business owner) to treat people the way that I want to be treated. I have just started journaling, and I am at a bit of a loss as to how to continue. Winning this DVD would really help me figure out my way. It is nice to know that your company is a small, family run operation, I love hearing about success stories like yours. Cheers to family owned, small businesses! I know how hard you and and John work! Would love to watch and learn from the video! I love reading about your company> Congrats! I am sorry I cannot purchase more of your wonderful stencils. I use them for the mixed media canvases I sell as well as for cards, scrapbooks and other projects! Thank you for sharing about hour company. It makes me live my stencils even more. I look forwars to receiving my stencils every month and can't wait to use them. Receiving the DVD would help me become a better artist by learning waus to create in my journal. Amazing opportunity! Thank you! I would love to have this video. I am a registered nurse who would much rather be a full time artist. But that's not possible right now. Art journaling helps me keep my sanity but my art time is quite limited. I am always looking for opportunities to learn new techniques and enjoy the imagination and creativity of others. I find it difficult to partake of workshops as life usually makes it hard for me to keep up with the class. Working at my own pace is my best bet. I love the artists in this video...love all your styles and creations. As I move toward retirement and the hope to spend more time on my art, this DVD would go a long way toward my goal to learn and play and create. Thanks for the opportunity to win. Loved that class! So excited that the videos have been released. So much I forgot. I just love the type of site you are and that you stay true to you! If I would win the DVD I would use it to hone my skills and try to get my dream of living the creative life back on track by opening my online store. You see in 2010 I resigned from my 23 yr career in Early Childhood to live the creative life full time from home. With the blessings and support of my husband I started on this journey. And then it happened... mystery pains started in 2011 - severe pains - after 7 drs. And a kabillion tests in June 2012 I found out I had a bulging disc in my back and in July 2012 came the diagnosis of fibromyalgia. The next 2 years were horrible pain filled years as they tried to see what meditations worked, didn't work and what ones reacted horribly with others. I literally went from 2 meds to 10 meds because of this.most causing drowsiness. Every ounce of strength I had was spent in my studio trying to regain the dream I know I am to live. In 2014 came the diagnosis of degenerative back disease and rheumatoid arthritis and in 2015 came lymphedema due to narrow veins and vessels in my legs so fluid collects in my calves and feet. And through all this every time I can get to my studio - I do because I may be in pain and have a lot going on but this will not take away my God given talents or my creativity. I am determined to reach my goal and have my dream of living the creative life and your DVD will add greatly to that.Thank you for the chance. Kris Johnson stampcrafter at yahoo dot com. Happy Holidays to your family and the stencil girl family! wow! incredible and looks like so much fun!!!!! wish i could work for you! Because I am an paper lover and art preacher!! until your pile of papers, gelli prints and journals reaches the top!! Here is my all.....I was one of those people that did not think I could do art. I am a late bloomer! I will be 58 in a few days. I started with stamps a few years ago. I love stamps but quickly became bored with the "normal cards". Then about a year ago I discovered the world of mixed media. I caught the mixed media fever very quickly. I started looking for mixed media on Pinterest which led me to You Tube, amazing artists and StencilGirls. While recovering from three surgeries in the last eight months which included a hip and total knee replacement, I have been educating myself on the world of mixed media, stocking up on supplies and dreaming about the projects I plan to create. Does anyone else out there dream about art? I now have a little tablet on my bedside table so I can jot down my ideas when I wake dreaming about art. I have been patiently (not so patiently according to my spouse) waiting to feel strong enough to organize "my room" and start creating. It has been three months since my total knee replacement. A little more about me; I work full time. I am married to a wonderful guy that bought me lots of StencilGirl stuff on Cyber Monday (early birthday present), mother to four, stepmother to two, grandmother to 15 and a Master Gardner. I have been busy during my recovery playing with my new stencils, doodling and making a special Christmas ornament for each of my grandchildren. I can be pretty intense ( I call it passion). I can be hard to follow in conversation because I can carry on three conversations at the same time, jumping from one thought to another without notice! �� I joined the StencilGirl Club last summer and love to follow all of the amazing artists on Facebook, You Tube, Pinterest and their blogs....I have meant through Facebook and blogs some amazing artists and truly wonderful people. I discovered through this "mixed media journey" that I have a favorite shape. I love circles. I am so impressed by the StencilGirl story and your small bisiness. I am the granddaughter, daughter and spouse of small business owners. I would love, love to have the DVD that you are giving away to continue my "mixed media journey" and increase my knowledge of art. And.... my favorite color is yellow! This would be wonderful to win. I've been absent from producing art for many months and could use new inspiration. There have been a series of life events and changes that leave me with little energy. So I took advantage of the cyber Monday sale and ordered several stencils. They arrived lightning quick! I'm so impressed with your service. Now I need some extra inspiration to kick start my experiments with them. And it's my birthday this week. That should get me a few points closer to the prize! OMGosh! I had no idea that you really did the stencils on your own! Thanks so much for sharing this glimpse into your company and the video with peeks into your set up! You and John must really be proud of your "baby" Great to have a few handpicked employees that can help bring all of the stencils to life as well! Really happy you shared this- Small business rocks!Small family business is the bomb! Thanks for the chance and fingers are crossed! Thanks, Jackie, so lovely to hear from you. 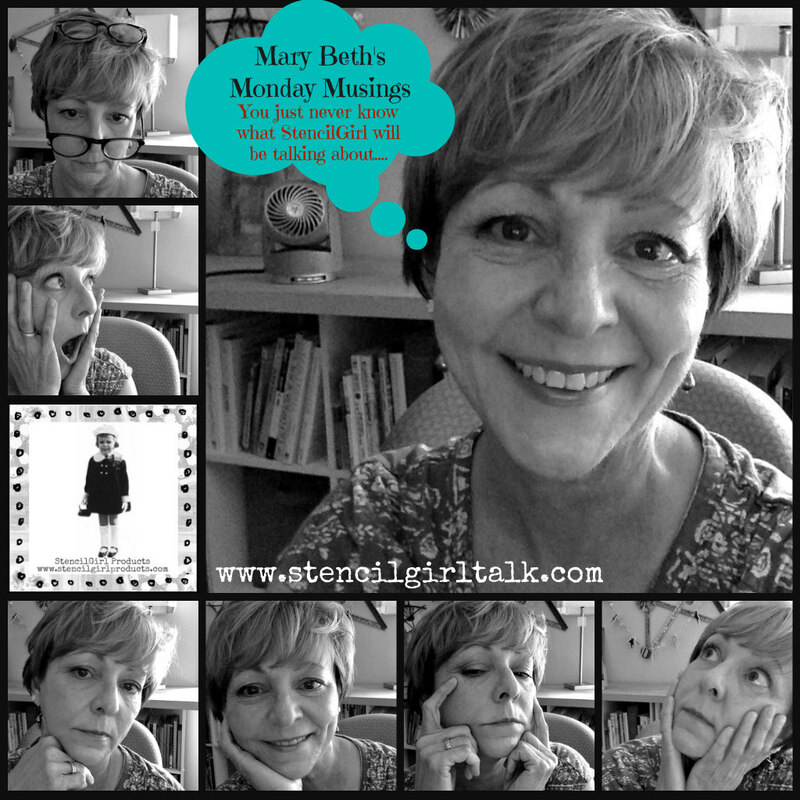 It thrilled me to see you on the Blog!! I loved your continuation of the story of your StencilGirl operation, and the video. You Rock, Mary Beth! And that includes your husband John (so patient & helpful) your son in law, all your cats & other helpers. I loved learning more of your back story. Thanks for the insight into your business. I thought it was a big company, given international customers, like me. I feel very much in the dark re art journals, so dvd would provide much needed info from great artists.... provided of course its acceptable to enter from across the pond. I need this DVD because I love all the artist and love to play in my journal. bethinil2003(at)yahoo (dotcom) BTW, I loved watching your video and seeing that you are a small company. Hi Mary Beth, I would also like to have the opportunity to win this. I am training to be an Art Therapist and know this will help me with my future dreams. That is so neat. Wonderful to hear how you work!! It's lovely company. Well done.